I was in the market for an new iPad case recently so when I was offered to review www.casehappy.co.uk an iPad case seemed to be the obvious choice for me, although when I noticed that they did cases for iPhones, kid’s shock-proof cases, water-proof cases, blue-tooth keyboards and laptop bags, I did take a while looking around the site. 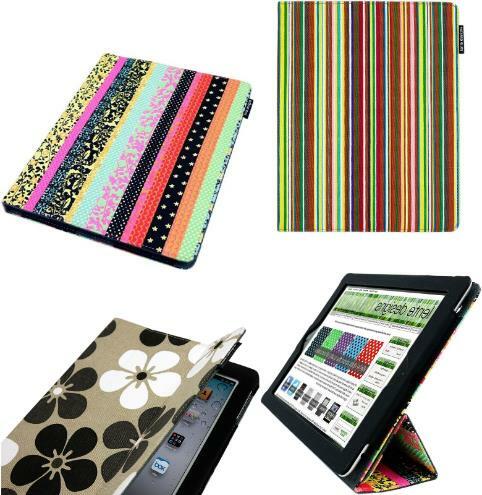 They do a great range of Kindle covers too as well as stocking lots of other tablet covers and load of really cool and necessary accessories. I finally made my choice though and went for the iPad Lente Designs® Fabric Cover in the Smithy Stripes Design which is now on offer at £22.95. It’s smart, bright and jazzy and very easy to find, because with my son, who sometimes allows me to use my own iPad, it could be anywhere! It’s a really sturdy case too and really easy to use the stand facility on it. Far easier than on my last case. Case Happy aim to be the number one online independent retailer of cases, covers and accessories for the Amazon Kindle and other tablet computers. The website is very easy to negotiate and the checking out facility is quick and easy to use. With the reasons below as to why to use Case Happy, I shall definitely be returning to this site when we are next in need of something case related. Here are some reasons to buy from CaseHappy? * I was offered a value to spend with Case Happy in exchange for a review. Next Post Summer holidays are nearly here!